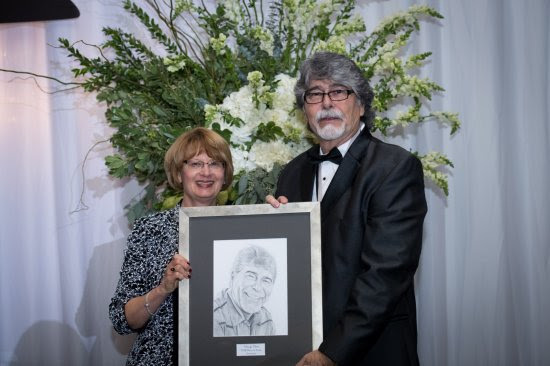 ALABAMA frontman Randy Owen has added another accolade to his long list of achievements. Last Thursday, November 15, in Birmingham, Alabama, the legendary country singer was formally inducted into the Alabama Business Hall of Fame. Owen's induction comes as result of his business dealings in music, agriculture and humanitarianism. "It's a great honor to be one of this year's inductees into the Alabama Business Hall of Fame," says Owen. "It's very special that my entire family got to share the night together. God bless all the fellow inductees, their families and our home state!" Founded in 1973 by the Board of Visitors of the Culverhouse College of Commerce at The University of Alabama, the Alabama Business Hall of Fame honors, preserves and perpetuates the names and outstanding accomplishments of business personalities who have brought lasting fame to the state of Alabama. Owen has been the lead vocalist of ALABAMA, the most successful and awarded band in country music history, for nearly 50 years. When he's not writing songs or performing on the road, Owen stays busy in Fort Payne, Alabama, operating his 3,000-acre ranch, Tennessee River Music, Inc., where he tends to 500 head of Hereford and Angus cattle. Much of Owen's time is spent helping others through his humanitarian efforts, such as launching Country Cares for St. Jude Kids, an annual radiothon fundraising event that has garnered more than $800 million for St. Jude Children's Research Hospital. He received the Ellis Island Award for his charity work with St. Jude. Owen and ALABAMA have played a key role in several disaster relief initiatives, including organizing and playing concerts to support rebuilding efforts from tornadoes that struck Tuscaloosa in 2011 and Jacksonville State University (his alma mater) in March of this year.